Thank you for visiting us! Pawtropolis is committed to protecting your privacy. Read below for our internet policy. We will not collect personal information about you just because you visit this site. We use these web pages to provide information pertaining to Pawtropolis, its services and products. These web pages may also offer you the opportunity to ask questions, request information, or provide comment. Use of this option is voluntary and may require an email address. We will only use information from submitted forms, email messages, and any other information you provide for the reasons you provided it. The information will be destroyed after the purpose has been fulfilled. We will not share the information you give us with anyone unless required by law. We also will not sell your information. We will not email personal information such as account-related or refund information as part of our response to you, since the confidentiality of Internet transmissions is not guaranteed. If chat rooms, forums, message boards, and/or news groups are made available, please remember that any information that is disclosed in those areas becomes public information and you should exercise caution when deciding to disclose your personal information. It is up to you if you want to assume the risk of an unauthorized person learning your email address or any personal information you provide. If you would like us to answer a question that involves your correspondence or personal information, please email us. Never heard of Doggie Daycare? The benefits of allowing your dog to attend doggie daycare are astounding. For young dogs it teaches them invaluable social skills that will help them learn how to properly meet and interact with a variety of other dogs. It also helps young puppies with their potty training because we keep them on a very routine potty schedule. 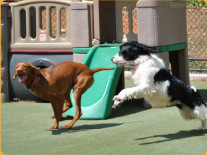 See an extended explanation of dogs in packs and the benefits of daycare. We have lots of greats pets available for adoption!